Jenna Foreman gets ready to swing at a pitch. Foreman and the Bulldogs went 2-3 in the Total Control Sports Invitational. Jimmy Lafakis/Collegian file photo. 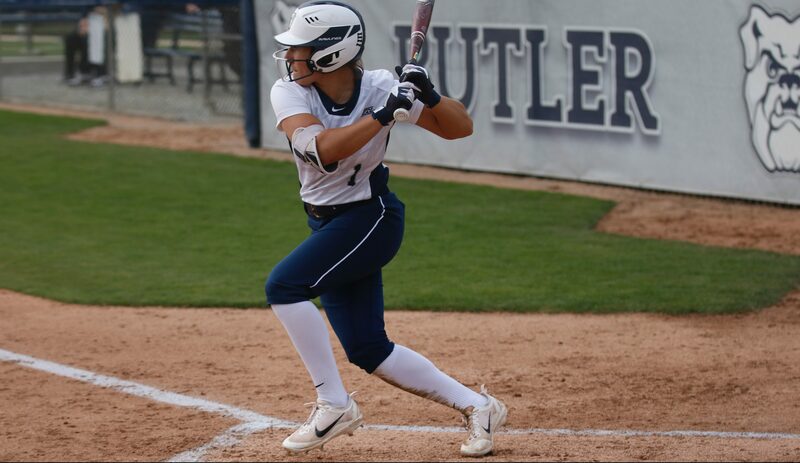 The Butler softball team opened up the 2019 season with a 2-3 performance at the Total Control Sports Invitational in Rosemont, Illinois. On Feb. 8, The Bulldogs kicked off the year with a dominating performance over cross-town foe IUPUI. Butler used RBIs from five different players to sink the Jaguars 8-0 in six innings. Sophomore ace Alyssa Graves also highlighted the Bulldogs victory during her 5.1 innings in the circle. Graves picked up the win for the Bulldogs in a five-hit shutout performance to open the year. In their second game of the day, the Bulldogs fell 7-1 to Western Illinois in freshman pitcher Karli Ricketts’ first start for the Bulldogs. Ricketts struck out seven batters in 3.2 innings but also gave up three runs before she was pulled with the bases loaded in the fourth inning. Senior Kaitlin Doud was brought in and pitched 2.1 innings while allowing three hits and two earned runs. Western Illinois pitcher Emily Ira held the Bulldogs to two hits while pitching a complete game. The Bulldogs lone run came off a Maddie Moore RBI single in the third inning. On Feb. 9, the Butler offense exploded for another win over an in-state squad. The Bulldogs overcame a 2-0 deficit in the first inning and scored six runs across the final four innings to defeat the Evansville Purple Aces, 9-4. The win gave Butler head coach Scott Hall his 200th career victory in his ninth season at Butler. The Bulldogs closed out Saturday with another matchup in which they overcame a first-inning deficit to even a Missouri Valley Conference opponent. The Bulldogs fell in walk-off fashion to Loyola Chicago, 5-4. Butler trailed 4-2 before Doud and Ricketts both notched RBI base hits to level the score heading into the seventh inning. Abbey Jacobsen led off the bottom of the seventh with a single to left field for Loyola, paving the way for Katie Polaski to double to center field and drive in the winning run. The Bulldogs closed out the weekend with a 5-2 loss to Detroit Mercy on Feb. 10. Butler found a way to notch seven hits in the matchup but subsequently left four runners in scoring position in the loss. Trailing 4-2 in the bottom of the fourth inning, the Bulldogs left the bases loaded. For their next series, Butler travels to Clearwater, Florida, for the Madeira Beach Invitational Feb. 15-17. The Bulldogs will face Delaware, Murray State, George Mason, Holy Cross and Drexel.